But he did not listen because his dreams and goals for his future required him to make the trip. “I must go,” the man told them,” Even though there is danger, and the risk is great there is more danger in not fulfilling my dreams and goals.” So the man left the safety of his home and friends and set out on a journey, a journey that would forever change his life, on a journey that would forever change your life. His friends were right the journey was rough and exhausting. Along the road he found evidence of robbers, yet with each step the words of the Psalmist echoed in his mind, “Even though I walk through the valley of danger and in the shadow of death, I will fear no evil for my God is with me and protects me.” On and on he walked through the hot sun and over the rough roads never looking back. Driven by the need to fulfill his dreams and goals he never stopped. Suddenly something exploded in his head and he fell unconscious to the rocky road. Hour’s later lying semi-unconscious on the ground a stranger walked by and ignored him a second time the scene repeated itself. Lying wounded on the ground he again heard the words of his friends. As his life began to fade and the darkness of death closed in he prayed, “I believe that all things work out for those who love you God, and I love you, Father.” Again he fell into unconsciousness. Suddenly he felt someone touch him, someone was trying to give him a drink of water, “Wake up my friend,” the Stranger said. Opening his eyes the man saw a man kneeling beside him. “Someone stopped to help me?” the injured man thought just before passing out. After giving the injured man first aid the Stranger took him to an Inn where the two could spend the night. 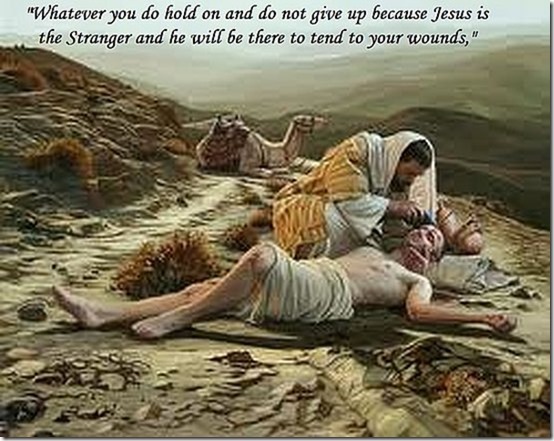 In the morning before the Stranger left he entrusted the injured man to the care of the Innkeeper. “I’ll stop back on my return trip to pay you any additional charges,” he told the Innkeeper before leaving. After two days the injured man recovered from his injuries and continued his journey where his dreams and goals still waited. As the events of his journey filtered into his mind he became richer and wiser than ever before. Were you able to relate to the injured man because his journey is your journey? You are the injured man, life has at some point has beat you up leaving you bleeding and wounded on the road of life. Perhaps even now you are wounded and bleeding. Perhaps someone has tried or is trying to persuade you not to pursuit your dreams, your goals. Whatever your situation this is about you and for you. Whatever you do hold on and do not give up because Jesus is the Stranger and he will be there to tend to your wounds, to give you first aid, to encourage you, to assist you, and then he will take you to God, the Keeper of the Inn the Keeper of the Kingdom. And, then when you’re ready God will once again send you on your way refreshed, healed, and strengthened.